This year’s Footwear Industry Awards took place on the 17th February 2019 at the Birmingham National Conference center. 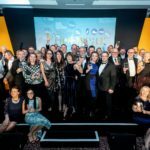 Organised by Datateam Business Media, publisher of Footwear Today magazine, the Awards have been specifically designed to celebrate the brands, retailers and professionals at the heart of the vibrant sector. Footwear Today editor Cheryl Taylor opened the evening’s proceedings with a speech, saying: “The Footwear Industry Awards is a chance for us all to reflect on the successes and achievements of this incredible sector over the past twelve months – and it’s heartening to see even more professionals turn out year on year for an unforgettable evening of celebration.” As always, the Footwear Industry Awards recognised the outstanding efforts of professionals across the sector. Guests at the ceremony had the opportunity to give a little back in the form of a fundraiser in aid of Footwear Friends and raised vital funds for the charity.